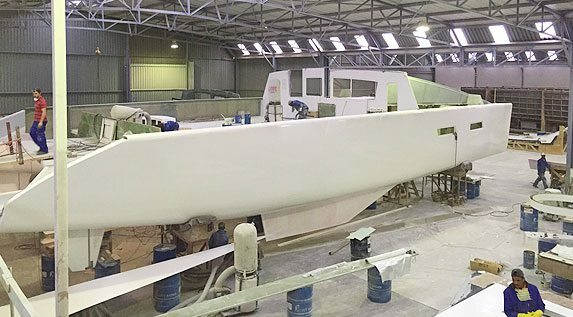 Don’t be fooled by the current construction site, Matrix Yachts building and design team are hard at work – to bring you Southern Africa’s largest luxury sailing catamaran. This feat of nautical engineering is a 76 -foot luxury catamaran, purpose built to host a wide range of corporate, special occasions and private functions. The hulls and bridge deck are in place, constructed with high tech fiberglass sandwich construction, giving the yacht its strong structure and stability. Soon the upper deck will be resurrected boosting its enormous saloon on bridge deck and large flybridge upper deck. The flybridge is unlike anything else in the world and will have VIP seating for 61 passengers with unobstructed views. In the final building stages the bridge deck level will be fitted with a large contemporary bar, seating for 52 people and a large open area that is versatile and able to be used as a dance floor, stage or whatever the occasion may require. No expense has been spared when it comes to safety with the vessel being designed and built to the highest code prescribed by South African Marine Safety Authority, Passenger Ship class VI. Mirage will not be your typical day sail catamaran, this lavish vessel will include motor yacht finishes – transforming your typical daysail catamaran. The size of the vessel is astounding, capacity 130 guests. Luxury of this nature is typically only available to a select few as is usually only found on Large Super Yachts. The yacht will be launched to begin the festive summer season 2016, offering exhilarating sailing experiences and inspiring views of the Cape. Mirage will offer visitors to the V&A waterfront the opportunity to see the splendour of the Mother City in all her breathtaking, scenic glory. Experience a fusion of gourmet food, upscale beverages and onboard a private yacht. Mirage is available for day and sunset sailing experiences, private functions and events. Booking now for 2016!